Rev. 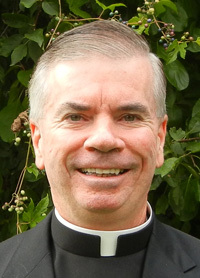 Mr. Kevin T. Mulligan, to be ordained a priest May 16. A former sportswriter with the Philadelphia Daily News for 27 years, the now Rev. Mr. Kevin Mulligan accomplished much as a writer, covering the Philadelphia Eagles during part of his stint as a reporter. He felt the urge to write after leaving the newspaper and beginning in 2007 around Thanksgiving, he became assistant director of communications for the Archdiocese of Philadelphia. “It was part of the plan. God brought me there for a reason,” said Deacon Mulligan, who was ordained a deacon last May and will be ordained a priest for Philadelphia on Saturday, May 16 at the Cathedral Basilica of SS. Peter and Paul and celebrate his first Mass the following day at 2 p.m. at his home parish, Visitation B.V.M. Church in Norristown; Father Paul Miceli from Pope St. John XXIII National Seminary will be the homilist. In his communications role he helped priests and bishops, including Cardinal Justin Rigali, with all things pertaining to the media. Deacon Mulligan was in the process of learning a new language, but something wasn’t complete. The job wasn’t for him. During Good Friday in 2008, anticipating the “Way of the Cross” devotion begun by Cardinal Rigali in imitation of Pope St. John Paul II’s devotion at Rome’s Coliseum each year, Deacon Mulligan opted to oversee the TV cameras covering the event at St. Charles Borromeo Seminary. After a gorgeous night participating in the stations of the cross with more than 1,000 archdiocesan parishioners present, and still the new guy on the communications staff, Deacon Mulligan walked to his car. He wasn’t going to quit his job, but uncertainty plagued him. This life change was difficult. Bishop Robert Maginnis was about to leave the event as well, and he yelled ahead to Kevin. In his short time at the Office of Communications, he had gotten to know the bishop fairly well. “How’s the job going?” Bishop Maginnis asked after catching up with Kevin. The bishop reiterated his gratitude to Mulligan for his efforts. He kept strolling with Bishop Maginnis, who told him to trust in God and practice patience. Three years later, Kevin sat in Maginnis’ office and described his prayer life. Kevin felt God yanking him in some direction, though he didn’t know where. At 53, he thought he was too old for the priesthood, so he settled on the possibility of becoming a permanent deacon. Bishop Maginnis listened, then informed Mulligan of the diaconate formation process. Kevin left the meeting thinking God might be calling him to the diaconate. He didn’t act afterward but prayed in the adoration chapel at Visitation Parish, where he found his calling. He later went to dinner with Bishop Maginnis and another friend. “You got something on your mind,” the bishop said to Kevin afterward. The bishop, who will vest Deacon Mulligan at the ordination next week, told Kevin he’d take his cause to Cardinal Rigali. Accepted in July 2010 to John XXIII Seminary in Massachusetts for men over age 30, Kevin began his studies two months later. One of seven children, he never felt the call to priesthood before that — not in high school at Bishop Kenrick in Norristown or grade school at St. Helena in Blue Bell — but he always had an admiration for priests at both places. Like his friend and fellow Philadelphia Deacon Jim Cardosi — who studied alongside Deacon Mulligan at John XXIII — God called the former sportswriter later in life. Deacon Mulligan, who as a priest wants to bring back fallen-away Catholics, expressed gratitude to John XXIII Seminary. He wouldn’t become a priest without it, or God. Congratulations on your now new assignment as pastor of St Genevieve in Flourtown. You sorely will be missed at OLC. Glad to hear this! Worked with Kevin at the Daily News back in the mid-80’s and he was always a great guy! God bless you, Kevin – I mean, Father Mulligan! !